This name uses Eastern Slavic naming customs; the patronymic is Petyovand the family name is Petrov. Martin Petyov Petrov (Bulgarian : Мартин Петьов Петров; born 15 January 1979) is a Bulgarian former footballer who played as a winger. CSKA is a Bulgarian professional association football club based in Sofia and currently competing in the country's premier football competition, the First League. CSKA is an abbreviation for Central Sports Club of the Army. Servette FC is a Swiss football club based in Geneva. They play in the Swiss Challenge League. The club was relegated to the third division in 2004–05 due to a bankruptcy, but achieved promotion to the Swiss Challenge League after the 2005–06 season, where the club remained until 2011. Servette earned promotion to the Swiss Super League after defeating Bellinzona in a relegation/promotion playoff on 31 May 2011. The club finished fourth in its first season back in the top flight, thereby gaining entrance to the Europa League second round qualification round for the 2012–13 season. However, they were relegated at the end of the 2013 season. In 2001 Petrov moved to VfL Wolfsburg, where he established himself as an explosive player. He made his competitive debut on 14 July 2001 in a 4–3 home win over Dinamo Minsk in the Intertoto Cup, scoring a goal and laying on an assist. Petrov made his league debut for Wolfsburg on the opening day of the 2001–02 Bundesliga season, in a 2–1 away loss against Bayer 04 Leverkusen on 28 July. In his first season at Wolfsburg, Petrov earned 32 appearances in the Bundesliga, scored 6 goals and provided 11 assists. FC Dinamo Minsk is a professional football club based in the Belarusian capital city of Minsk. On 30 October 2004, Petrov scored all four goals in Wolfsburg's 4–3 win over Mainz 05. He made 30 appearances during the 2004–05 season finishing as the club's top scorer with 12 goals. He also made 14 assists. 1. Fußball- und Sportverein Mainz 05 e. V., usually shortened to 1. FSV Mainz 05, Mainz 05[ˌmaɪnts nʊlˈfʏnf] or simply Mainz, is a German association football club, founded in 1905 and based in Mainz, Rhineland-Palatinate. 1. FSV Mainz 05 have played in the Bundesliga, the top tier of the German football league system, for eight consecutive years, starting with the 2009–10 season. The club's main local rivals are Eintracht Frankfurt and 1. FC Kaiserslautern. In addition to the football division, 1. FSV Mainz 05 have handball and table tennis departments. The 2004–05 Bundesliga was the 42nd season of the Bundesliga, Germany's premier football league. On 14 October 2006, Petrov suffered an anterior cruciate ligament injury during a game against Recreativo de Huelva and was sidelined for more than six months. He made his comeback for Atlético from a serious knee injury on 28 April 2007, playing for 56 minutes in a 0–0 draw against Real Betis. On 6 May, Petrov netted Atlético's only goal in their 2–1 defeat at Espanyol. Real Club Recreativo de Huelva, S.A.D. is a Spanish football club based in Huelva, in the autonomous community of Andalusia. Founded on 23 December 1889, they are the oldest football club in Spain, and currently play in Segunda División B – Group 4, holding home games at Estadio Nuevo Colombino, which has a 21,600 capacity. Real Betis Balompié, S.A.D., more commonly referred to as Real Betis or just Betis, is a Spanish football club based in Seville, in the autonomous community of Andalusia. Founded on 12 September 1907, it plays in La Liga, having won the Segunda División in the 2014–15 season. It holds home games at Estadio Benito Villamarín in the south of the city. Following the influx of new players at Manchester City such as Carlos Tevez and Emmanuel Adebayor, Petrov was linked with a move away from the City of Manchester Stadium. He was often in and out of the first team. However, he scored goals in the first two games that he had started, prompting Hughes to start Petrov in place of Shaun Wright-Phillips at home against Fulham. Though he scored, he also aggravated the knee injury that had plagued him. After the sacking of Mark Hughes and arrival of Roberto Mancini, he started both league games and scored in the 2–0 win over Stoke City on 26 December. He also publicly expressed his anger against Hughes as Petrov was frequently moved in and out of the starting 11. On 22 June 2010, it was announced that Petrov had agreed terms with Bolton Wanderers,  and the free transfer was completed when the transfer window opened on 1 July. He scored his first goal for the club against Manchester United on 26 September 2010,  and finished the season with three goals. His 2nd season saw him score six goals, four in the League, one in the League Cup and one in the FA Cup as Bolton were relegated from the Premier League. At the end of the season, Petrov had played enough matches (needed 30 played 35) to activate a clause in his contract, extending his contract for another season. Petrov signed for La Liga side RCD Espanyol for the remainder of the 2012–13 season on 14 January 2013. He struggled to establish himself as part of the first team and left the club at the end of the season. Stiliyan Alyoshev Petrov is a Bulgarian former professional footballer who played as a midfielder. Petrov joined Celtic from CSKA Sofia in 1999, and won ten trophies in his time at Celtic Park, including four Scottish Premier League titles. In 2006, he moved to Aston Villa in the Premier League, along with his former manager Martin O'Neill. Petrov became club captain at Villa Park, and was an inductee to the Aston Villa Hall of Fame in 2013. In addition he is Bulgaria's all-time most-capped player with 105 appearances for the side. Dimitar Ivanov Berbatov is a Bulgarian professional footballer who is currently a free Agent. 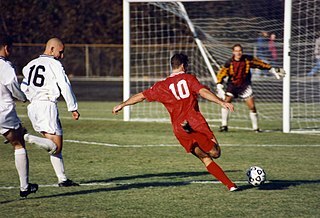 A striker, he captained the Bulgaria national team from 2006 to 2010, and is the country's all-time leading goalscorer. He has also won the Bulgarian Footballer of the Year a record seven times, surpassing the number of wins by Hristo Stoichkov. 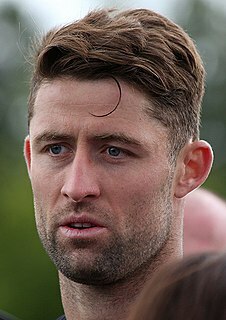 Martín Gastón Demichelis is an Argentine retired professional footballer who played usually as a central defender, although he could also operate as a defensive midfielder. Dimitar Dushkov Penev is a Bulgarian football coach and former player and central defender of CSKA Sofia. He played 90 games for Bulgaria national football team and scored 2 goals. He is regarded as one of his country's best ever defenders, winning Bulgarian footballer of the year in 1967 and 1971, he also participated in 3 world cups for his country in 1966, 1970 and 1974. He is currently the Honorary President of CSKA Sofia and semi-pro side Nottingham United FC. Valeri Domovchiyski is a Bulgarian footballer who plays as a striker for Botev Vratsa. José Manuel Jurado Marín is a Spanish professional footballer who plays for Chinese club Changchun Yatai F.C. as a central midfielder. Georgi Iliev is a Bulgarian professional footballer who captains Cherno More Varna. He is usually deployed as a central midfielder. Martin Miroslavov Kushev is a Bulgarian football manager and former player who is currently an assistant coach at Slavia Sofia. Martin Kamburov is a Bulgarian professional footballer who captains Beroe Stara Zagora. Kamburov plays as a striker. Among Bulgarian fans he is widely known as "The Emperor". Yasen Petrov Petrov is a Bulgarian former football player. His nickname is Giannini from Plovdiv. Daniel Dimov is a Bulgarian professional footballer who currently plays as a centre back for Turkish club Boluspor. Boris Petrov Galchev is a Bulgarian footballer who plays as a midfielder for Septemvri Sofia. Svetoslav Petrov is a former Bulgarian football midfielder. Nikolay Bodurov is a Bulgarian professional footballer who captains CSKA Sofia and plays for the Bulgarian national team. Bodurov plays mainly as a centre back but has also played as a right back on some occasions. The 2010–11 season was Bolton Wanderers's twelfth season in the Premier League, and their tenth consecutive season in the top-flight of English football. It was the second season with shirt sponsors 188BET. Hristo Stoichkov is a Bulgarian former footballer who is currently a football commentator for Univision Deportes. A prolific forward, he is regarded as one of the best players of his generation and is widely considered the greatest Bulgarian footballer of all time. He was runner-up for the FIFA World Player of the Year award in 1992 and 1994, and received the Ballon d'Or in 1994. 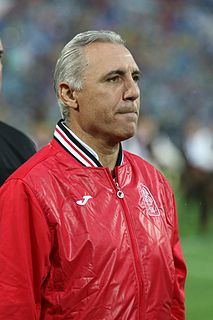 In 2004, Stoichkov was named by Pelé in the FIFA 100 list of the world's greatest living players. Simeon Slavchev is a Bulgarian professional footballer who plays as a midfielder for Azerbaijani club Qarabağ and the Bulgaria national football team. Luiz Fernando da Silva Monte, commonly known as Fernando Karanga, is a Brazilian footballer who plays as a forward for Henan Jianye in the Chinese Super League. ↑ "Martin Petrov". Soccerbase. Retrieved 17 December 2012. ↑ "Мартин Петров дебютира с гол за Волфсбург" (in Bulgarian). segabg.com. 16 July 2001. Retrieved 18 January 2013. ↑ "Petrov hits four in Wolfsburg win". CNN.com. 30 October 2004. Retrieved 18 January 2013. ↑ "Petrov picked by Atlético". UEFA.com. 22 July 2005. Retrieved 17 December 2012. ↑ "Petrov out for six months". ESPN.go.com. 16 October 2006. Retrieved 17 December 2012. ↑ "Man City swoop for winger Petrov". BBC sport. 26 July 2007. Retrieved 17 December 2012. ↑ "Petrov hit by wounded knee". Manchester City F.C. 26 October 2009. Retrieved 17 December 2012. ↑ "Out of contract senior trio leave Blues". Manchester City F.C. 8 June 2010. Retrieved 8 June 2010. ↑ "Petrov Agrees Terms With The Wanderers". Bolton Wanderers. 22 June 2010. Archived from the original on 24 June 2010. Retrieved 22 June 2010. ↑ "Petrov Deal Complete". Bolton Wanderers F.C. 1 July 2010. Archived from the original on 4 July 2010. Retrieved 1 July 2010. ↑ "Bolton 2 – 2 Man Utd". BBC Sport. 26 September 2010. Archived from the original on 8 February 2011. Retrieved 26 September 2010. ↑ "Petrov signs for Espanyol". RCD Espanyol. 14 January 2013. Archived from the original on 19 January 2013. Retrieved 14 January 2013. ↑ Dimov, Stanko (17 May 2014). "ЦСКА завърши втори, Марто се сбогува с "Армията", куп пропуски за домакините". topsport.bg. Retrieved 30 June 2014. ↑ Smith, Alan (6 October 2007). "Martin Petrov revelling in Manchester City role". Daily Telegraph. London. Retrieved 17 December 2012. ↑ "Martin Petrov". Yahoo! Eurosport UK. Retrieved 17 December 2012. ↑ "Martin Petrov". National Football Teams. Benjamin Strack-Zimmerman. Wikimedia Commons has media related to Martin Petrov .